If you want to keep your washer and dryer for any significant amount of time, it’s imperative that you maintain it. 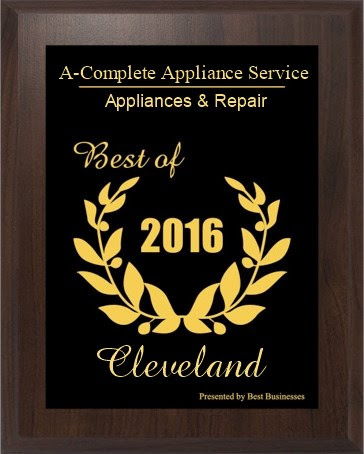 This means that when you have problems, you give Complete Appliance Service a call for washer and dryer repair in Cleveland. 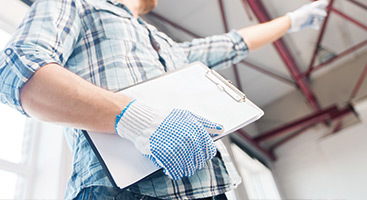 It also means that you need to periodically deep clean your machines so they can function at their best for as long as possible. Cleaning your washing machine regularly means that you not only are able to keep your washer in tip-top shape for as long as possible, but your clothes get cleaner. A dirty washing machine can build up soap and fabric softener, leading to a moldy smell on your clothes. If you use your washing machine frequently, it’s best to clean it once a month; otherwise, once every few months is sufficient. Empty your washer. Add two cups of baking powder into the machine, then run a long, hot water cycle. Next, add two cups of vinegar along with ten drops of your essential oil of choice (tea tree has antifungal properties). Run another cycle at the hottest and largest setting. After the cycle is finished, wipe down the drum and agitator with a microfiber cloth and more vinegar. If you find stains, make a paste of baking soda and vinegar and scrub. If you have a front-load washer, make sure to clean the rubber seal as well. Wipe down with vinegar and essential oil. To clean the exterior of your washing machine, start by cleaning the door with a solution of vinegar and water with a microfiber cloth. If you have very dirty areas you need to address, presoak them in an all-purpose cleaner, then scrub with a toothbrush. If your dispensing tray is very dirty, try soaking it then wiping clean. Leave your washer door open after every load. This prevents mold and mildew growth by allowing the leftover moisture to evaporate. If you ever experience your laundry smelling mildewy after you wash it, it’s likely this is why. Never leave clothes in the washer; move them to the dryer immediately. Again, this prevents mold and mildew growth. Try making your own fabric softener instead of using store bought. Store-bought fabric softener often leaves a residue in the washing machine, making it dirtier more quickly. Don’t use too much detergent. Excess detergent will stick to your washing machine, which causes odors and dulls the color of your clothes. 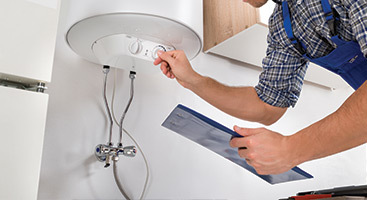 Use small quantities, particularly if you have a high-efficiency washer. 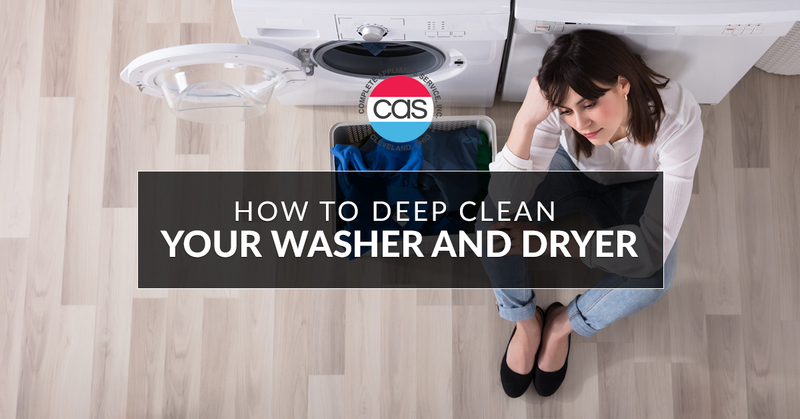 Dryers are a bit more complex to clean, but that doesn’t mean it’s not worth the effort. In fact, a dirty dryer can even cause fires, if lint touches a heating coil. Depending on how frequently use it, you can clean a dryer every six months to a year. Also keep in mind that dryers are constructed differently, so it’s best to consult the manual before attempting to clean the dryer. Remove the discharge hose from the back of the dryer and shake out the debris. Remove the back panel. Vacuum up the excess lint with the brush attachment of your vacuum. Vacuum your lint trap. If possible, remove part of the lint trap to get at the excess dust. Next, vacuum in the drum for any left behind lint. Finally, wipe down the drum with an all-purpose cleaner and microfiber cloth. Put back together any panels or hoses you removed. No matter how clean you keep your washer and dryer, it’s inevitable that they will need repair at some point. If you need washer and dryer repair in Cleveland, we would be happy to accommodate. 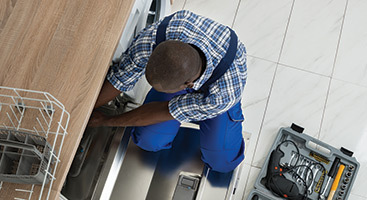 Contact Complete Appliance Service today!